The Pavillon of General Motors. Standing in line for the entry of the Futurama. At the right characters of "Highway and Horizons". "The World of Tomorrow" was the theme of the World's Fair of New York in 1939. Officiel guide book of the exposition in 1939. Trylon (10 meters [700 feet] high tower, a kind of needle with a triangular outline) and Perisphere (a sphere with a diameter of 61 meters [200 feet]) were the architectonical marks of this world exposition. Admission ticket of 1940. 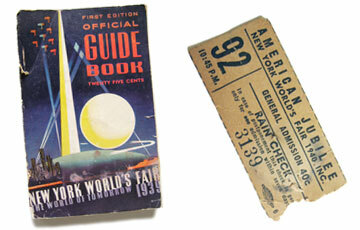 The World's Fair was extended from 1939 to 1940. This idea of a world of tomorrow included the enthusiastic presentation of town-planning utopies ( the staging "Democracity" in the perisphere), the conquest of landscape by the technology of transportation (14-lane highways in the exhibition "Highways and Horizons" in the Futurama of General Motors). The presentation of new technological achievements for everyday (from the electric dishwasher to colour photograph). The Westinghouse Company presented "Elektro", a "moto-man", 7 feet (2,13 meter) large and 130 kilo heavy, which was able to count by his fingers [not really]. above others "Elektro" is shown ( a the beginning of the last third, look also for the thumbnails of the movie).